In the past, I would let Junior choose which one he wanted to paddle. My usual approach was to say “The Bomb Pop is lighter and more stable but the Cherry Bomb is also very stable and even though it’s heavier, it’s also faster so once it’s in the water, it won’t feel heavier. Which one do you want to paddle?” He would always choose the Bomb Pop, I think because it’s somehow less intimidating. This could turn frustrating for me. It’s always fun being out on the water and satisfying to see my kid embrace kayaking but spending half my time waiting for him to catch up is not ideal. My epiphany was just not to ask the question. Instead, I just said “Listen, we know I’m the faster paddler so you should take the faster boat. It’s stable enough. It’s got a rudder if you have trouble turning it so I’ll take the Bomb Pop and you’ll take the red one, ok?” His response was a simple “Ya, alright”. Damnit, I thought, that was too easy, should have done that long ago. It was late morning when we drove past the Croton-Harmon train station to the put-in near the mouth of Croton River where it empties into Croton Bay and the Hudson River. It’s a spot I’ve been using for many years. Back in the day, I almost never saw anybody else there, either at the launch spot or on the water. 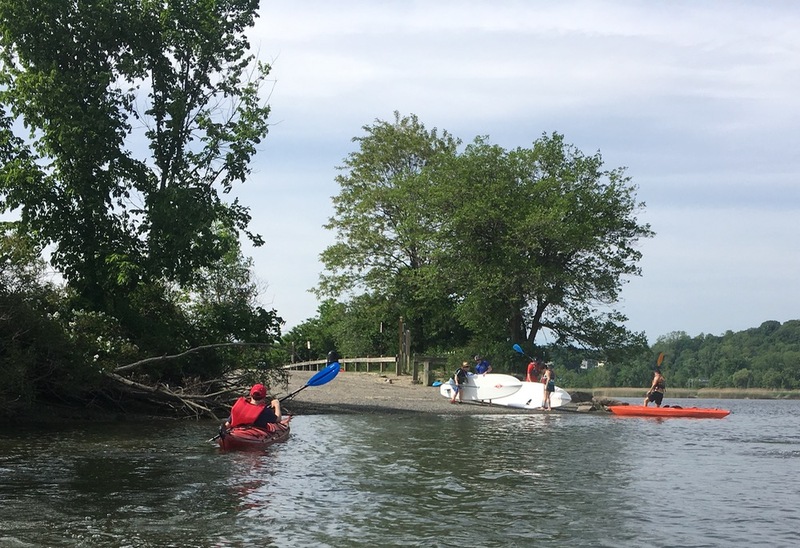 Today, the spot has increased in popularity to the point where it’s worth it for a local outfitter to setup rentals for kayaks and Stand-Up-Paddleboards in the summer months. Now there’s always four or five people putting in or taking out, using their own boats or rentals. That was the case last Saturday. We took the kayaks off the roof and got them ready. I pushed Junior out into the river and then had to call him back when I realized I hadn’t adjusted the foot pedals for him. When you put in here, there are two options. 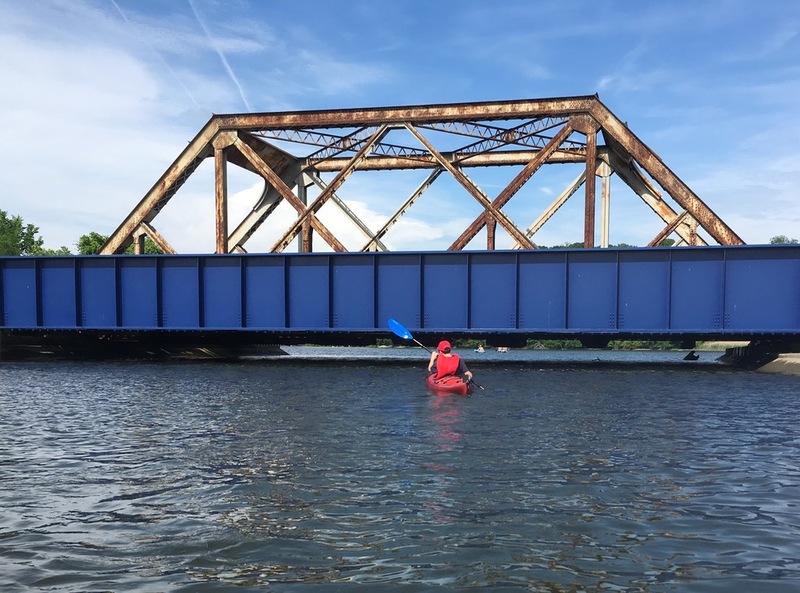 You can turn left and paddle up the Croton River towards Croton Dam and Reservoir or you can turn right, paddle under a train trestle to Croton Bay and, beyond that, into the Hudson River proper. Going up the river is fun. You pass Van Cortlandt Manor House, a historical site and museum built around 1732. There are some homes on the other side but the shore is mostly wooded. 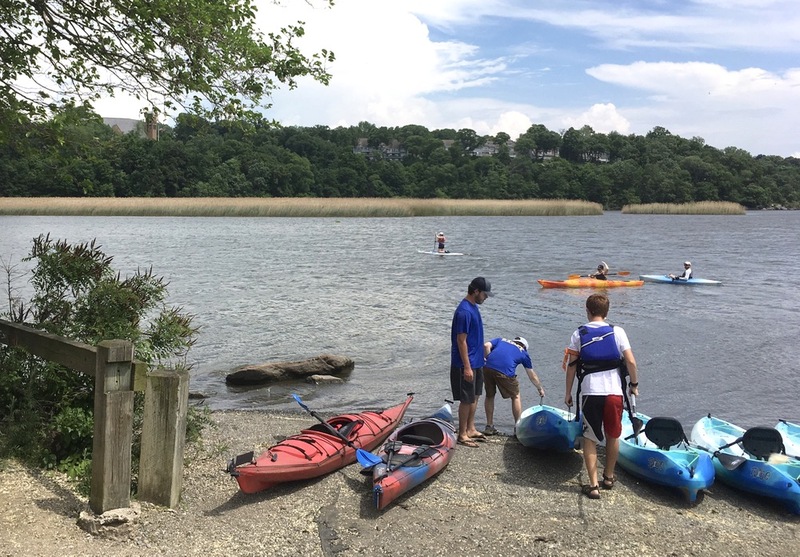 The Croton narrows as you head upstream the paddling and — if it hasn’t rained recently — the paddling can get more difficult. Eventually you are stopped by some shallow rapids that flow on either side of a little wooded island. Though most of the folks on the water that day were heading upstream, we went the other way, ducking to squeeze under the train tracks and head out into the bay. As we put the train tracks behind us, Croton Bay opened up in front of us. 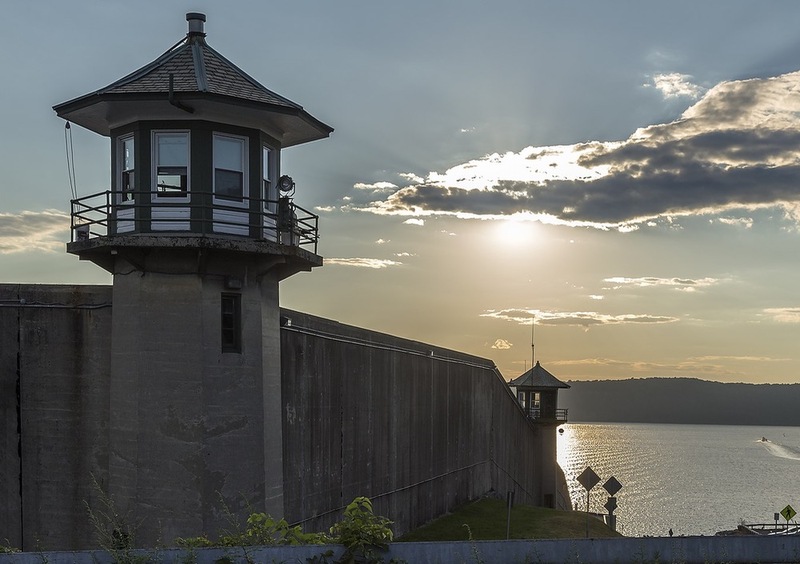 Across the water to our south was the town of Ossining, including Sing Sing prison. To the north, on the eastern shore is roughly a mile of peninsula sticking out into the Hudson, forming the north side of Croton Bay. Croton Point Park occupies most of this little finger of land. The park has a beach, picnic areas and a small camp ground. Here and there in the sheltered waters of the bay pleasure boats bobbed in the Chop. We zigged and zagged, generally to the west, at times close to the grassy shore north of us and at times further out into the bay. Junior took a little time getting used to the big red kayak. I encouraged him to play around with the rudder a bit, deploying it, retracting it and experimenting. Ultimately, he decided to leave it stowed when he discovered that it slowed him down when it was in the water. I knew this to be true, but I thought it was better for him to learn it through experience. We made our way past Croton Point and paddled north into more open water where conditions were predictably rougher. Before too long we’d had enough and returned to the bay, sticking close to the shore and following its contours eastward until we slipped back under the train trestle and returned to our launching point. It was a short, successful foray. Junior seemed to remember what I’d taught him in years past and has become a noticeably stronger as a paddler. My slower-paddler-in-the-faster-boat strategy worked well and we both had fun. As a first paddle of the season, I couldn’t have asked for a better day. Looks like fun! 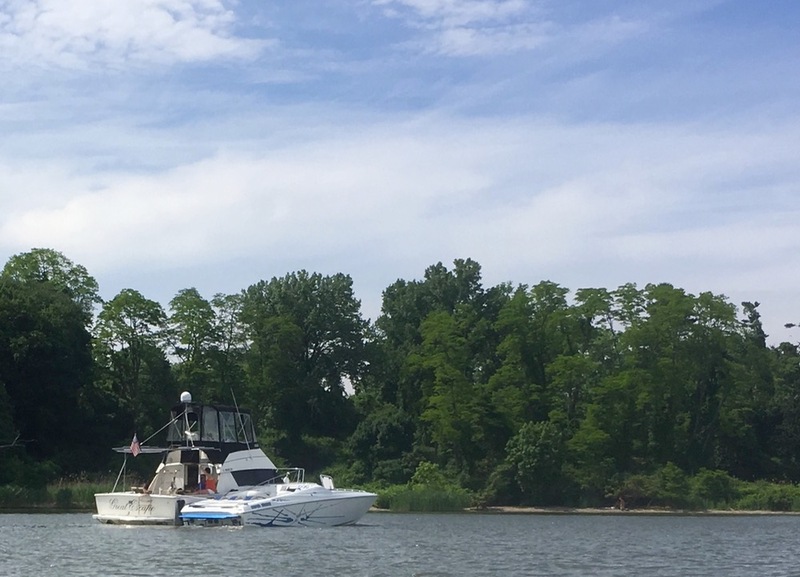 Any day out on the Hudson River is a good day. This is great! We for sure have to have a summer outing with you and the kids. We love to kayak when we can and its good to know of a nearby place to do this. 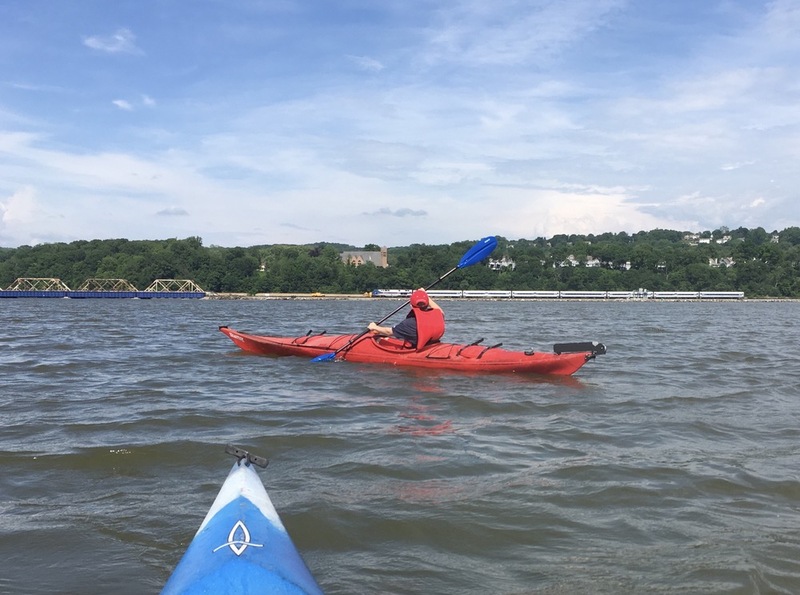 We have talked about kayaking the Croton Bay for a while and now we know how to do it. Thanks guys. Great idea, Ray. Maybe we can arrange a meetup in Piermont some time this summer. There’s good paddling around the marsh there.